Gene therapy may be on the cusp of revolutionising medicine as we know it. The delivery of biologics directly to cells and tissues where they are needed promises to reap real rewards transforming patients’ lives. MeiraGTx is a company that is committed to the development of novel gene therapies to transform the lives of patients suffering from acquired and inherited disorders. It’s a world where research and development are forging new treatments and affecting positive results for a host of patients across the globe. MeiraGTx would task Rochester-based Clean Room Construction Ltd (CRC) to deliver suitable flooring for their inaugural clean room facility in London that could meet the companies’ rigorous standards in cleanliness and bio control. CRC is one of the UK’s leading specialists in the design and construction of cleanrooms and controlled environments for science and technology. Established in 1967, they also refurbish and service cleanrooms for a host of clients ranging from leading universities and general research laboratories through to biotechnology, microelectronics and pharmaceutical companies. It’s a total cleanroom solution from conception through to completion. CRC would specify two products for the new MeiraGTx cleanroom from international flooring specialist Gerflor which would easily meet the project’s stringent requirements. Ian Isted, Projects Director at CRC commented, “CRC tendered for the MeiraGTx project on a design and build basis with this being its first Cleanroom facility in the UK.” Ian went on to add, “we specified approximately 1200m2 of Gerflor’s Mipolam Biocontrol using their Mixdim colour, together with the Gerflor Clean Corner System throughout the facility”. Gerflor have been managing life sciences contamination for over 80 years, delivering new, innovative solutions to meet the stringent demands of the market and its environments which embraces; pharmaceuticals, cosmetics, medical devices, together with research labs and the biotechnologies sector. Mipolam Biocontrol from Gerflor is specifically formulated for cleanroom environments. Treated with a high-performance coating, it’s extremely resistant to chemicals, highly resistant to scratching and can withstand very heavy loads. Mipolam Biocontrol is tested by the Fraunhofer Institute and complies with GMP Class A for micro-biological cleanliness and provides an excellent resistance to bio-decontamination procedures. It is bacteriostatic against the development of micro-organism on the flooring. Certified for use in ISO-4 cleanrooms and is 100% recyclable. Ian Isted went on to further say, “We specified Gerflor’s Mipolam Biocontrol as we wanted a high-quality floor finish to match the performance criteria in line with the structures and services on the rest of the project”. In partnership with cleaning professionals Gerflor has developed the Clean Corner System which is a patent pending, innovative corner solution. Years of research and development by Gerflor has led to this unique system which is only effective with Gerflor floors. The Clean Corner System technology meets the requirements of professionals in the pharmaceutical industry in accordance with GMP (Good Manufacturing Practices) including easy coving with limited and easy welding. The Clean Corner System for contamination control in cleanrooms is watertight, resistant and durable, easy to clean and decontaminate, offering a clean, attractive and uniform finish. 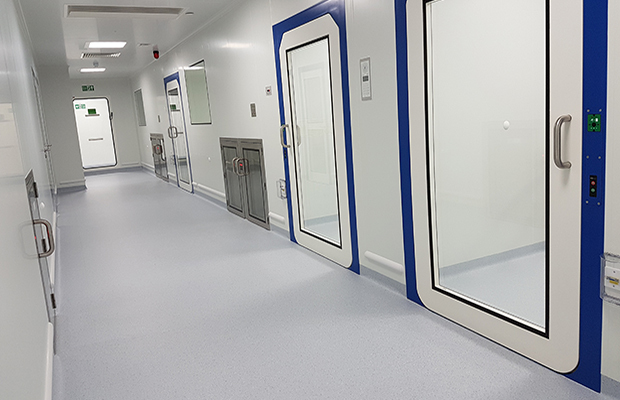 Paul Quinn ended by saying, “for me there’s no better products on the market when it comes to cleanroom and biotechnology in flooring.” Ian Isted also finally commented, “we haven’t used Gerflor products before, but certainly would again as we found them very easy to work with”.